And what was so weird about it was, I put no pressure or heat on the frames. 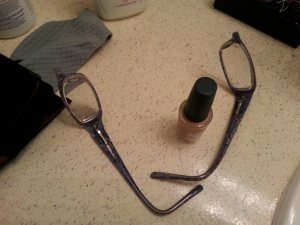 As casually as any of you lenswearers would slide a pair of glasses onto your face, that’s how much pressure I applied, and, PLACK!! They just…fell apart. It was Memorial Day Weekend, 2012, and I was in Washington, D.C. to attend my sorority daughter’s wedding. I hadn’t seen my daughter or her chapter sisters since 2008, and hadn’t done anything sorority-related since, so this was going to be a reacquiantance/presentation moment for me. Gotta look good for the sorors! The Crowd Pleasers! 2003 – 2012. Rest in pieces.